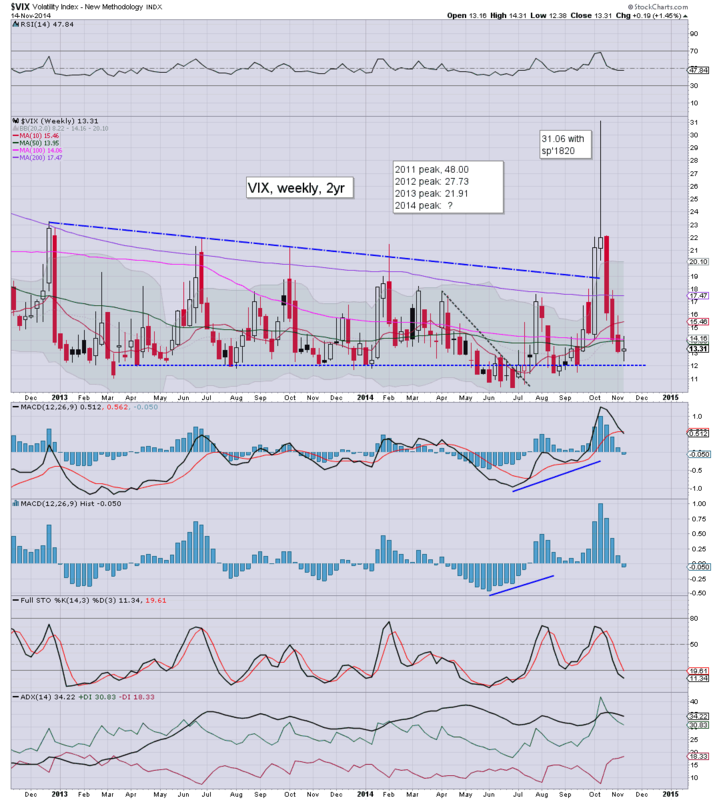 With equities remaining in a tight trading range, the VIX remains very subdued, settling -3.5% @ 13.31. Across the week the VIX gained 1.4%. Near term outlook offers the upper teens, but a break/hold above the 20 threshold looks highly unlikely in the rest of 2014. A moderate jump in the VIX seems a given before mid December, but even the 16/17s look difficult on the first push higher next week. With no realistic hope of sub sp'1900s for some months, there seems ZERO point in being long VIX. US equities settled the week with some mixed chop, sp' +0.5pts @ 2039. The two leaders - Trans/R2K, both settled lower by -0.1%. 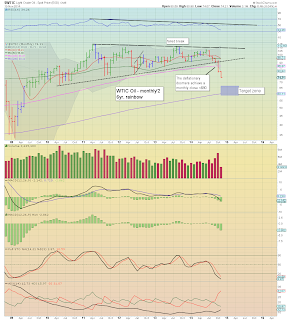 Near term outlook continues to offer a retrace, but then.. that has been the case for the last two weeks... urghh. A brief look at the hourly chart covering the last 22 trading days, clearly shows a market that is obviously tired.. having ramped from sp'1820. 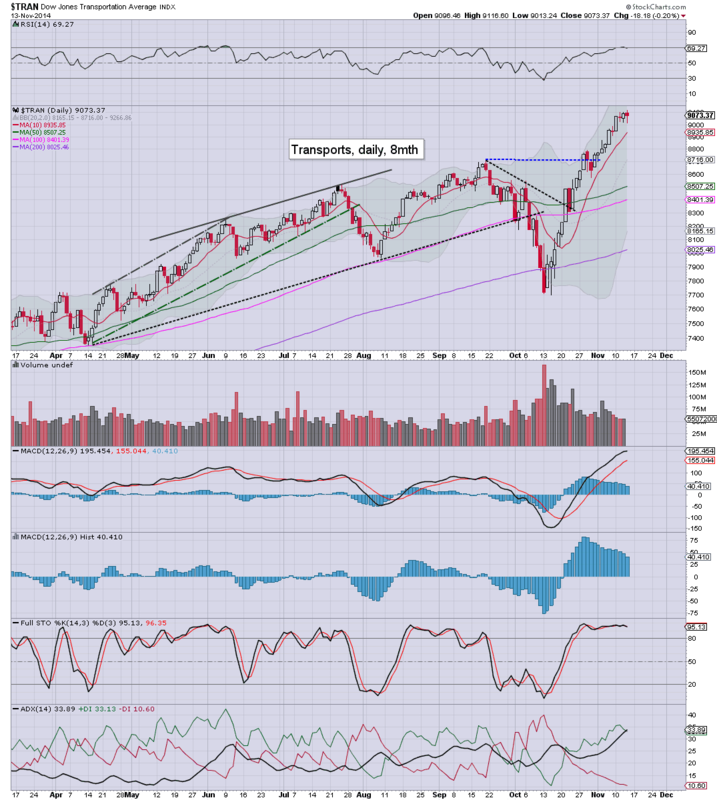 We're due a retrace.. best guess remains sp'1980/50. Sincerely... have a good weekend everyone. *the usual bits and pieces to wrap up the week... across the evening. 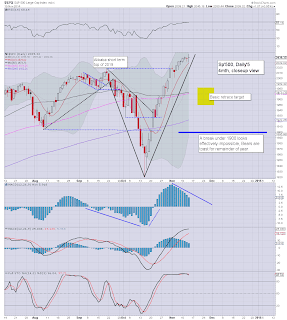 Equities look set for continued minor weak chop into the weekly close. Regardless of the exact close, with new historic highs set this week for the Dow, Trans, and sp'500, the bulls remain in full control. 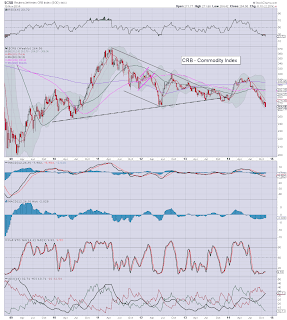 A reversal in the USD continues to help inspire commodities. Smaller 5/15/60min cycles are mixed, I suppose it could be argued for a touch of weakness into the close.. but in the scheme of things... it is barely worth speculating about. With the metals holding strong gains, the miner ETF of GDX is +5.5%... having opened -2%. no doubt there will be a lot of chatter about this powerful reversal on the usual gold bug sites this weekend. After all... metals have floored... right? Yeah.. sure they have. 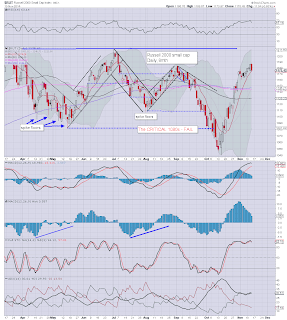 US equities continue to see the same old minor chop.. if a little fractionally weak. With two hours to go, there is still plenty of time for a weekly close back under the daily 10MA of sp'2031. Metals have built very strong gains, Gold +$26 (2.4%). 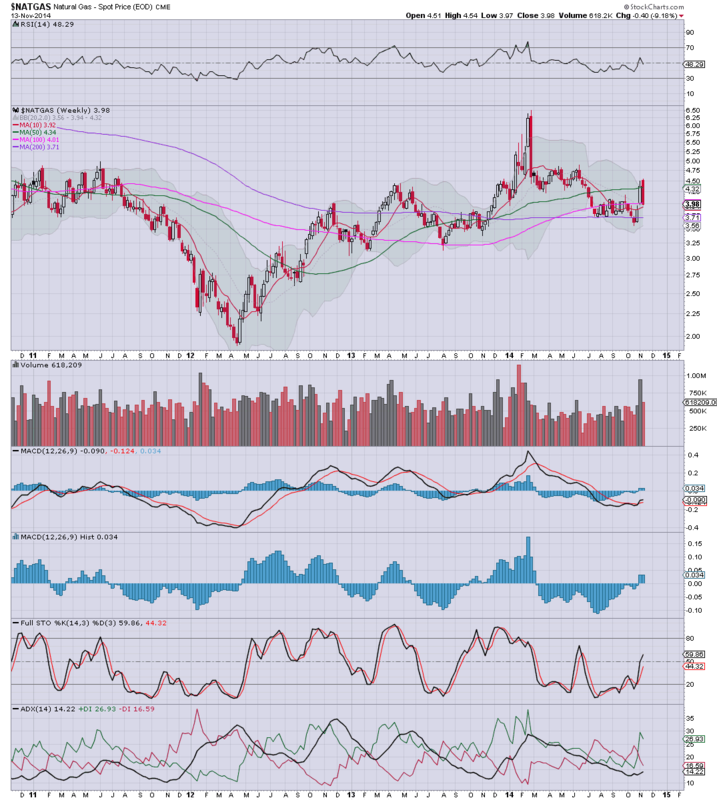 With the USD now moderately lower, Oil.. along with the metals are getting an extra boost. Still... broader trends remain the same. Notable strength, TWTR +3.4%, AMZN +3.7%... momo stocks having a reasonable end to the week. US equities continue to see mixed chop.. with a touch of weakness. 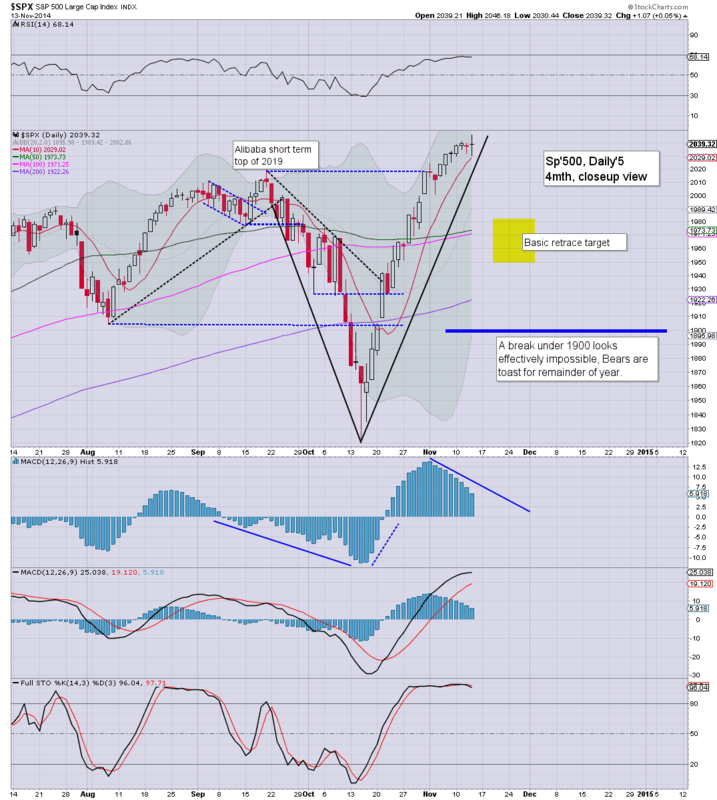 A weekly close under the daily 10MA of sp'2030 looks viable, which would likely equate to VIX 15s. Metals are holding sig' gains of $12, having reversed from -$12. Weakening USD is no doubt helping. There is little else to add right now, on what is a relatively quiet end to the week. All the wild day to day swings of late Sept/early Oct' are now a fading memory. At best, bears might see sp'1950 within 2-3 weeks, but really, that seems all that is viable. 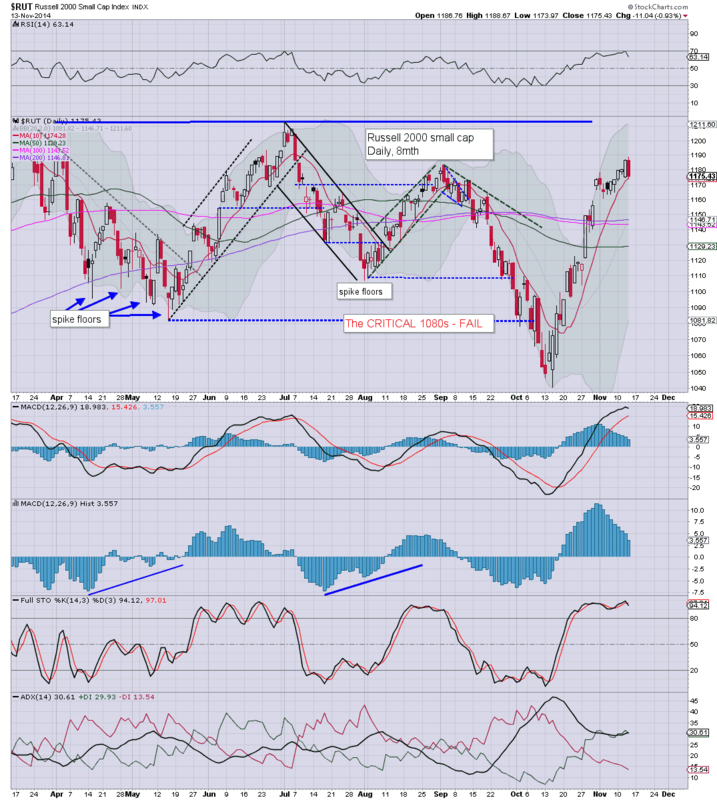 US equities are seeing minor chop, and a break under the daily 10MA of sp'2030 now looks very viable this afternoon. With the USD losing most of the earlier gains, the metals/miners are rebounding strongly, Gold +$13. *see MACD (blue bar histogram) cycle, which has now ticked lower for the ninth consecutive day. The fact the market has managed to claw new highs - as recently as yesterday, is testament to the powerful underlying strength. 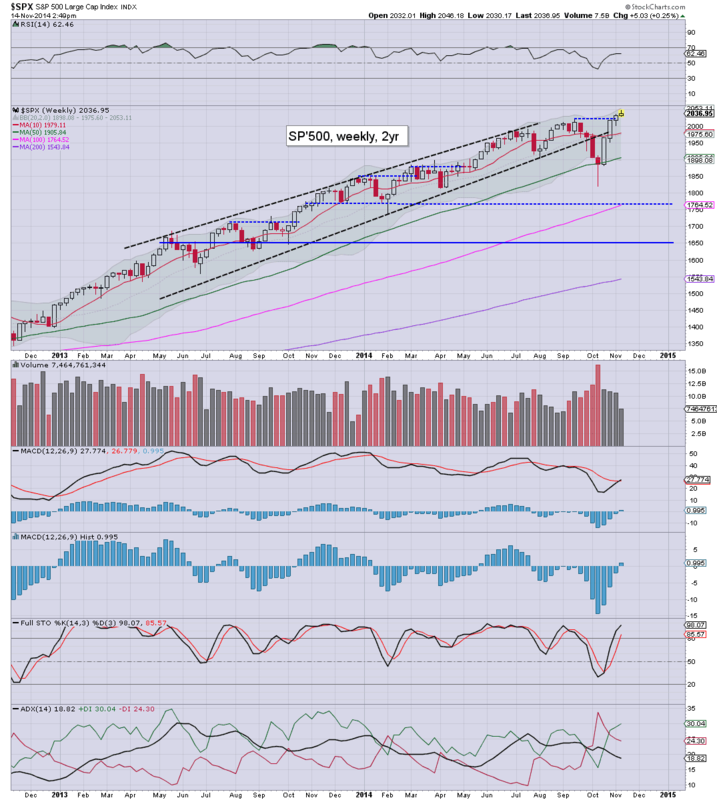 A bearish MACD cross looks due in 2-3 days.. which should see the sp'500 slip back below the big 2000 threshold. 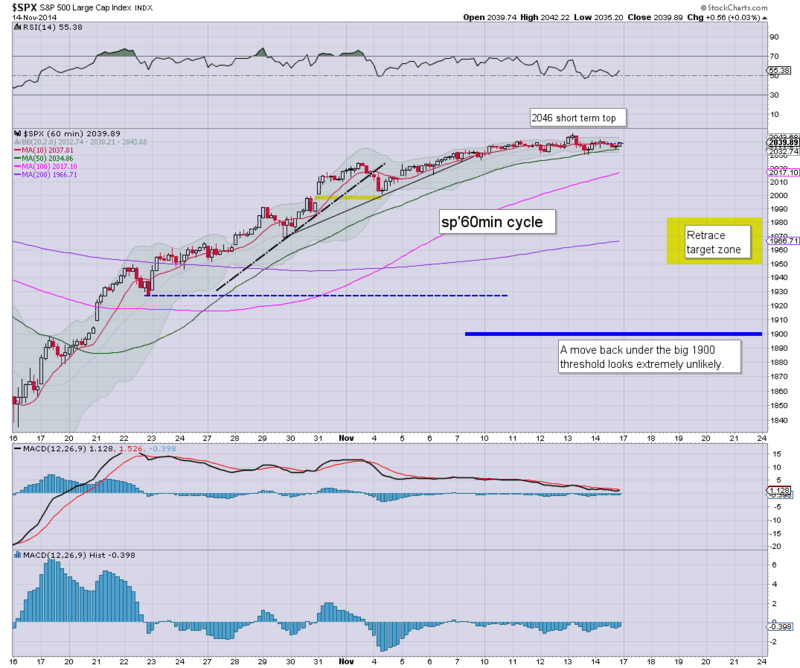 At best...1980/50... on no outlook can I see sub 1900 for the remainder of the year. A powerful bullish engulfing candle... same for the miners. 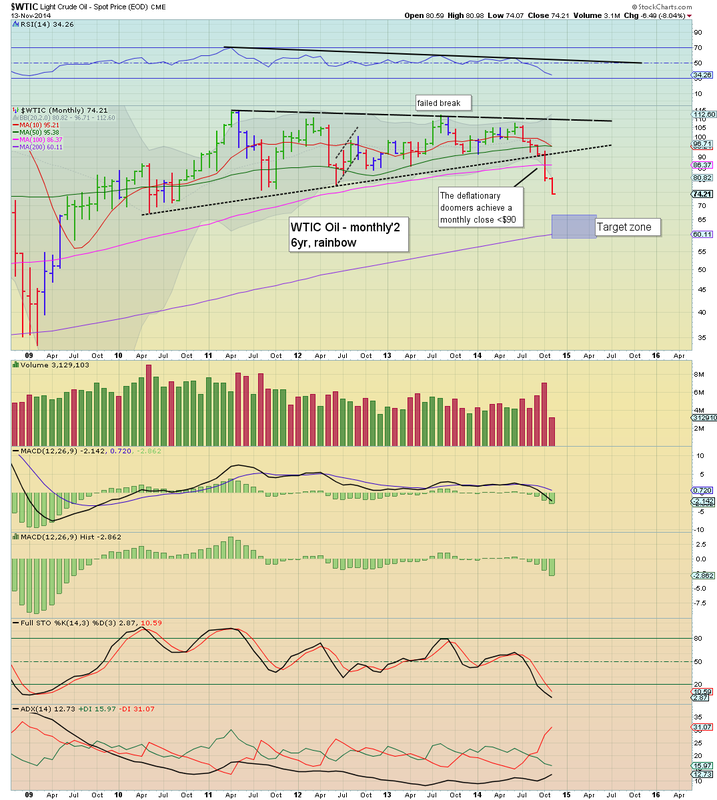 If those levels hold into the weekly close.. it is bullish.. at least for early next week. US equities with minor mixed chop. 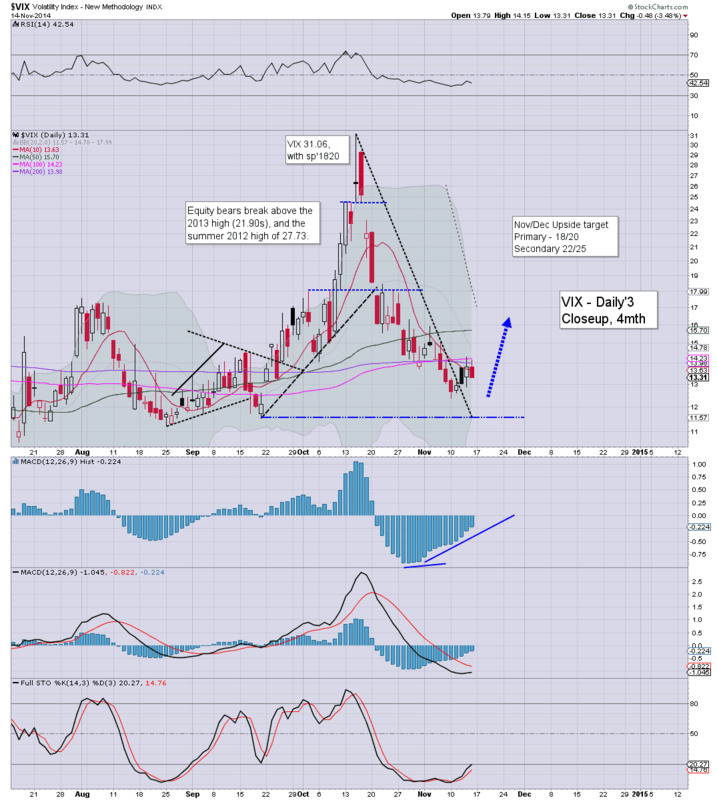 Equity bears should be seeking a break under the daily 10MA of sp'2031... along with a weekly VIX close in 15s. Metals are weak, Gold -$3, whilst Oil is bouncing, +0.9%. It has been a very quiet week... any daily close <2030 would probably clarify that the next week or two will be one of moderate downside. 10.08am . Gold +$7... the USD is cooling, slipping back under 88.... so.. that is probably the reason.. along with short covering. Regardless.. broader metal/miner trend is still lower. *retail sales, +0.3%.. a touch higher than expected. So.. flat market, but with the USD on the rise, there is some downward pressure across ALL $ asset classes. 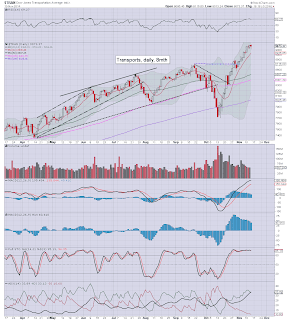 Not surprisingly, Oscar is bullish... all the way to the sp'2100s.. and that target looks viable by year end. 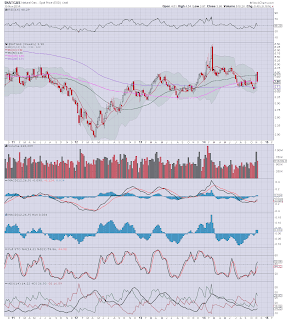 It was another bearish day for energy prices, with Nat' gas falling -4.1%, settling @ $3.98. 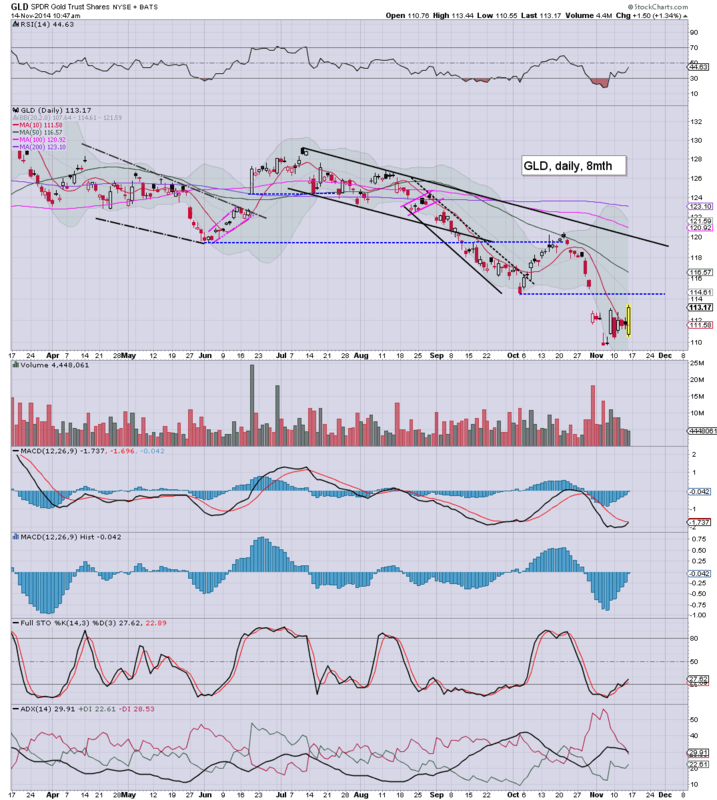 WTIC Oil closed lower by a very significant -3.5% @ $74.21. The broader downside target of $65/60 zone looks well within range by early next year. Perhaps most amusing.. if not outright bizarre today, was seeing clown finance TV (channel'1, aka CNBC) hostess... Kelly Evens seem borderline upset at the continued falls in Oil prices. 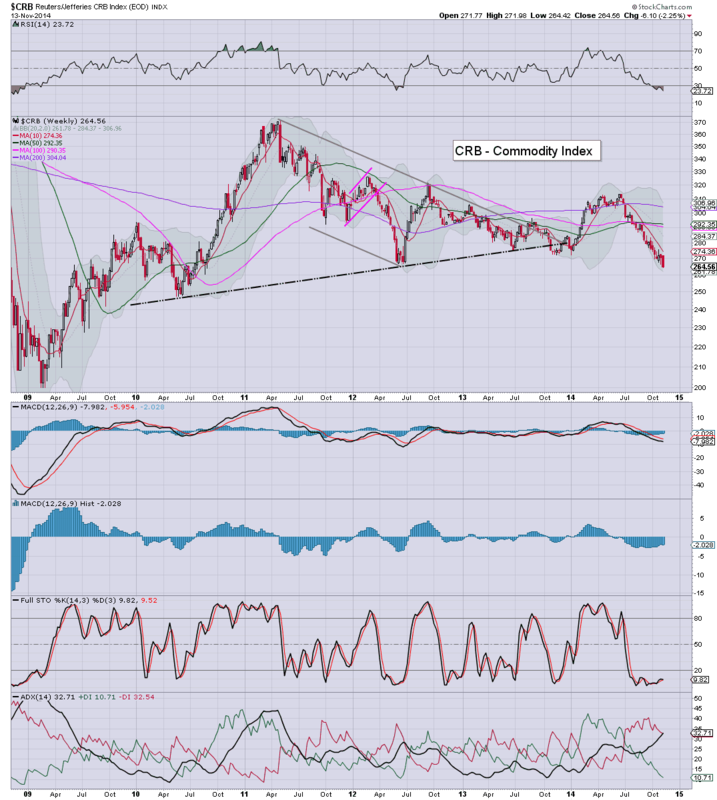 Far from being a commodity bubble, commodity prices have been weak since early 2011. I'm not sure who was writing the script for Evans this afternoon, but it was even more incorrect than normal. Today's CRB close of 264 was the lowest level since Aug'2010, back in the days pre-QE2, and before the Gold/Silver bubble blew up. Friday will see Retail sales, import/export prices, consumer sent' and business inventories. That will be a fair amount for Mr Market to cope with, and if any of the data comes in a little weak, it'll be a very fair excuse for the market to sell lower into the weekend. US equities broke a trio of new historic highs in the morning, but saw increasing weakness in the latter half of the day, sp' settling +1pt @ 2039 (intra high 2046). 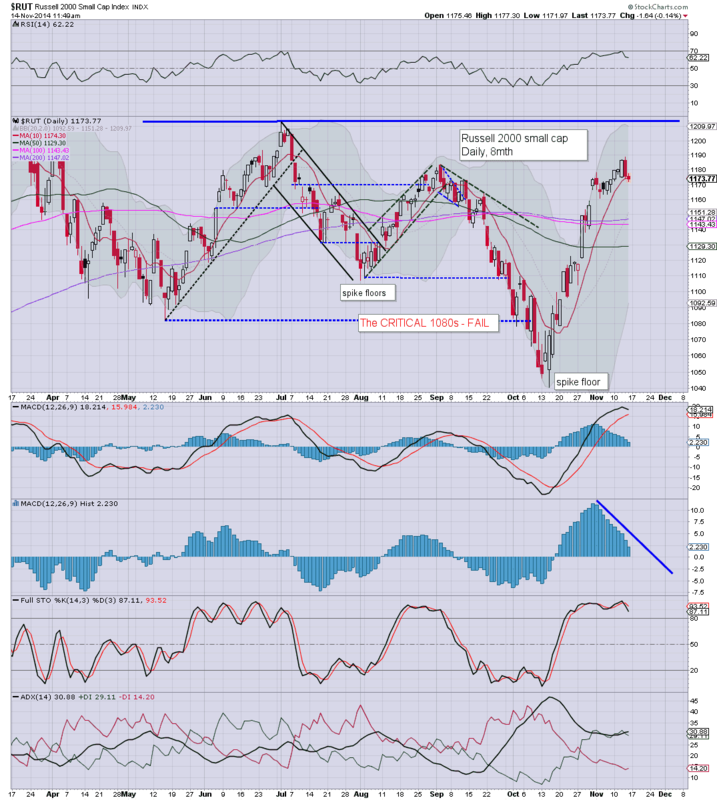 Near term outlook offers a retrace, back under the giant sp'2000 level. Even the most permabullish traders are now seeking some degree of equity market retrace. What is clear though, considering the regular new index highs, a move back under the critical sp'1900 level, looks out of range. How can the 'Pitbull low' be deemed in, if we broke a new historic high this morning?